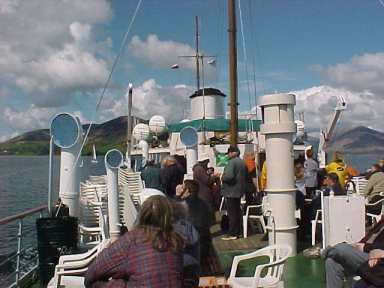 While much of the UK celebrated Easter 2000 with torrential rain, Balmoral departed Glasgow Anderston Quay in glorious sunshine on Easter Saturday, 23rd April, for a traditional 'doon the watter' trip to Rothesay and Tighnabruaich. The sunshine was to stay with us all day giving spectacular views of the Firth of Clyde. 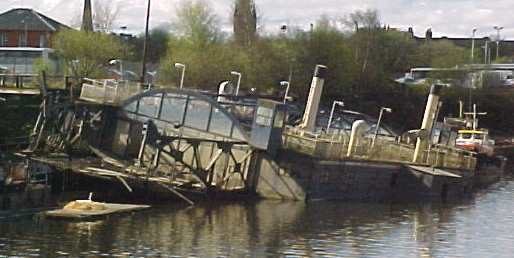 Not long after leaving the quay, as we approached Bell's Bridge, the pedestrian crossing that swings open every time Balmoral and Waverley sail, passengers had a good view of the rapidly redeveloping banks of the Clyde. 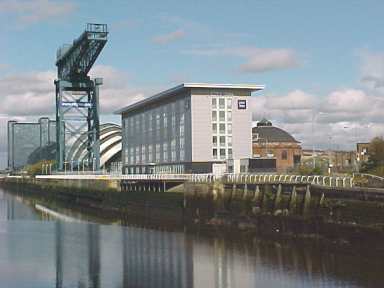 On the north bank, in juxtaposition, the old and new architecture of the harbour - the red brick North Rotunda of the former Harbour Tunnel (now infilled) which serves now as a casino restaurant contrasted with the rectangular box of the new City Inn, the magnificent lattice structure of the huge Finnieston 'hammerhead' crane (built to lift locomotives onto ships at a time when Glasgow's five locomotive builders were supplying over 70% of the world's steam locomotives) dominated the silver reflective structure of the Clyde Auditorium, compared by some to Sydney Opera House but known affectionately by Glaswegians as the 'Armadillo'. Finally, the tall glass tower of the Moat House Hotel which sometimes gives magnificent reflections of the Armadillo. All of these developments are sited on land reclaimed from the former Queens Dock from which ships had sailed to ports around the world. Passing through Bell's Bridge, Balmoral passengers could not miss two new developments springing up on the site of the former Princes Dock / Plantation Quay (now, sadly, renamed Pacific Quay) from which ships of the Allan Line had left for America and others for the Antipodes. The new developments include an IMAX cinema - this building looks a bit like a giant motorcycle crash helmet - and the new Science Centre and Millennium Tower - a high tech visitor attraction due to open in 2001 and a site which may figure significantly in Waverley's future. After passing the heliport on Stobcross Quay, we had a good view of the 'Tall Ship in Glasgow Harbour' one of the Clyde's newest visitor attractions. The 104 year old, 3 masted barque Glenlee was built at Anderson Rodger's shipyard in Port Glasgow for the local Sterling Shipping line. She carried cargoes to Australia and America. After many years in Spain the ship was returned to the Clyde and restored with the assistance of a £2m Heritage Lottery grant. 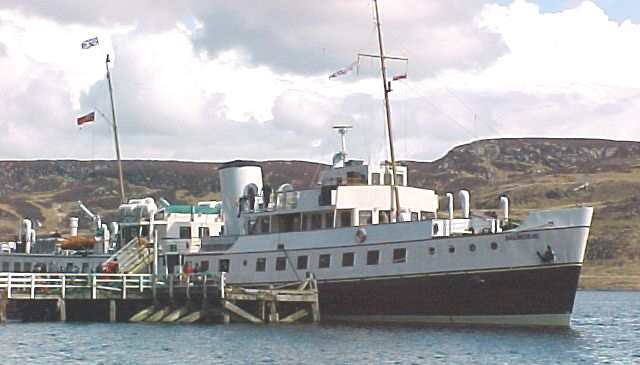 She lies at Yorkhill Quay, for many year's the base for the Anchor Line's weekly sailings to New York and also their services to India and Burma. 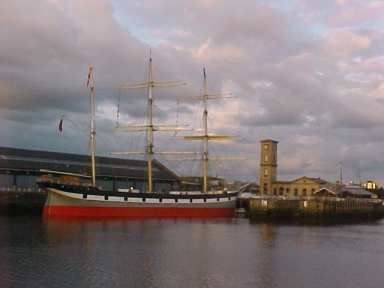 The Glenlee is operated by the Clyde Maritime Trust which has also restored the former hydraulic pumping station of the Queen's Dock and uses it as a cafeteria, shop, etc. As Balmoral cruised on down the river an older face of the Clyde was observed for a stretch of 2 or 3 miles. 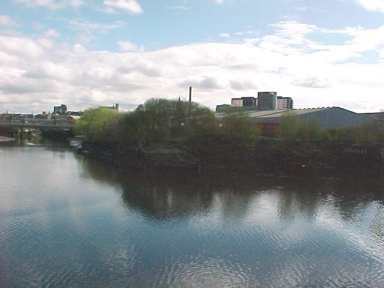 Soon we were passing the mouth of the River Kelvin, on the right bank of which the remains of the Inglis shipyard where Waverley was built in 1946-47 can still be seen (through the bushes). However, that may change very soon as Clydeport plc have plans for a massive £500m redevelopment of the river bank into a San Francisco style Fisherman's Wharf development! The final remains of Inglis yard will disappear under that scheme although it is interesting that a new housing development on the site of the yard's former engine works is called 'Waverley Gardens'. Ten minutes after leaving Anderston, Balmoral was passing the Govan shipyard now operated by BAE Systems. 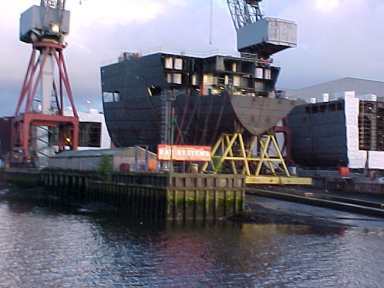 There was much media comment recently as the future of the famous shipyard is under threat. Balmoral's passengers were impressed by the massive sections of a new fleet oil tanker for the Royal Navy which is being assembled on the main slipway. It will be completed later this year and the yard will close unless new orders are found. The yard has constructed over 800 ships since it was opened by an ingenious engineer called John Elder in 1864. Elder is credited with the development of the compound reciprocating steam engine of which Waverley's magnificent 2,100 hp engine is a descendant. 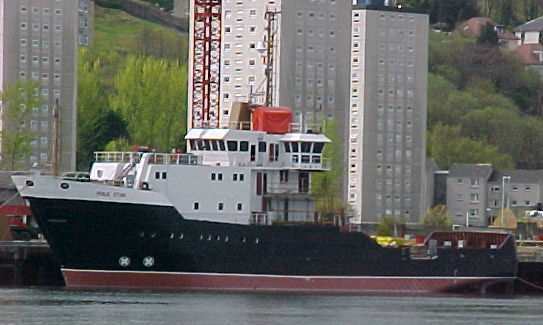 For most of its life the Govan shipyard traded as the Fairfield Shipbuilding & Engineering Company and its products ranged from many large liners for the Canadian Pacific line to battleships and aircraft carriers for several navies and the famous Clyde paddle steamer Jeanie Deans and P & A Campbell's last paddler, the Cardiff Queen. As late as 1961, Fairfield built a fleet of 9 reciprocating engined ferries for the passenger services across the Bosphorus in Istanbul, some of which still survive. Hopefully, the yard will get more orders and that great tradition will continue. 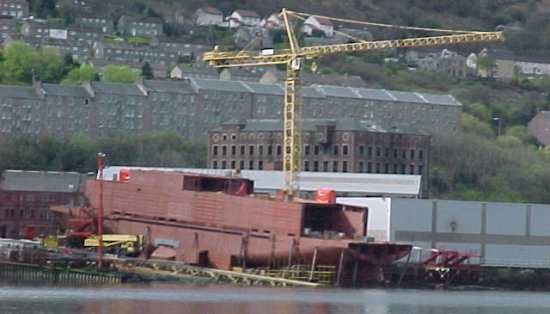 Further down river Balmoral passed the former Yarrow shipyard, which is also now operated by BAE Systems. Through the door of the covered building hall, we had a good view of the new Type 23 frigate HMS ST ALBANS which is due to be launched on 6th May. 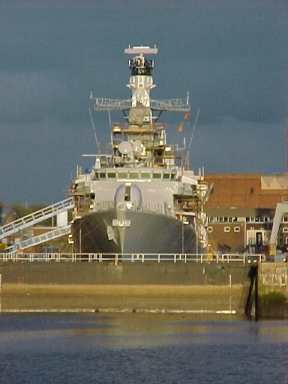 Further downstream her sister vessel HMS Portland was seen in one of the three Elderslie dry-docks formerly operated by the famous shipbuilding company of Barclay Curle, which created many fine liners, such as the Uganda and Nevasa for the British India Steam Navigation Company. Yarrow have built 13 of the UK's 16 Type 23 frigates over the last 10 years and now, as BAE Systems, it is the lead yard for the design and supply of the new Type 45 destroyer; the construction of the first example will be in the period 2002-2005. The yard has commenced building the first of three patrol vessels for the Sultan of Brunei. On the opposite shore we observed the massive new Braehead shopping and leisure development on a site once earmarked for a four-fold extension of the existing King George V Dock. 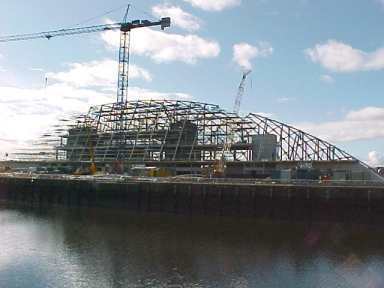 Part of the new centre is a maritime heritage centre called Clydebuilt. Apart from two historic Clyde built vessels - the 92 year old steam yacht Carola and the 128 year old coaster Kyles - there is not much external exhibition, although a 'sculpture' depicting 2 shipbuilders apparently pulling the bow of a ship out of the building has recently appeared. Passing the harbour at Renfrew, we had the sad sight of the former steam driven chain ferry Erskine, which partially sank in the basin during the winter - her future does not look good. The Renfrew harbour basin is known locally as the Pudzeoch (pronounced pud-yeoch) and there is much debate, from time to time, as to the origin of this name. An old map of Renfrew - one of the oldest Royal Burghs of Scotland - shows a stream at this point called Puddock River, so this seems a likely source. Puddock is an old Scottish word for a frog! After a visit below for 'internal restoration,' we regained Balmoral's promenade deck as she passed the very successful little shipyard of Ferguson Shipbuilders at Newark, Port Glasgow, which has built over 300 vessels since it opened in 1903. Its latest product the Pole Star, a lighthouse tender for the Northern Lighthouse Board, was seen at the fitting out quay. 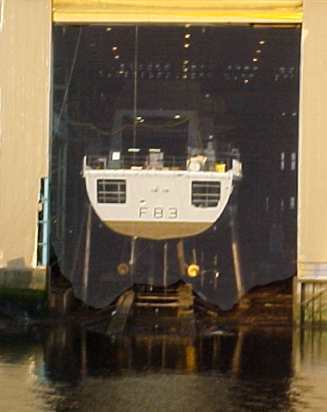 She had been launched just 4 days earlier and will replace the classic lighthouse tender Fingal at Oban later this year. Sadly, she does not replicate the lines of Fingal but will, no doubt, be a highly functional vessel. On Ferguson's building slip we saw the structure of Yard No 708 which will become the latest Caledonian MacBrayne car ferry when she enters service later this year. Happily, Calmac have reverted from their 'Isles' style nomenclature for their major ferries and this ship will be given the traditional name, Hebrides. At Greenock, Balmoral made her first call picking up a healthy number of passengers, including Waverley rebuild project manager Gordon Reid, home for a well deserved Easter break. Ashore were Waverley's Clyde based 'rebuilders' - Alison, Alistair, Derek and Kenny Henderson - on a temporary diversion from their dedicated task of restoring Waverley's historic steam machinery in time for its reunion with the vessel in May / June. Gordon was able to tell us that Waverley had been refloated from the dry-dock a couple of days earlier and another significant stage of her rebuild had been achieved. 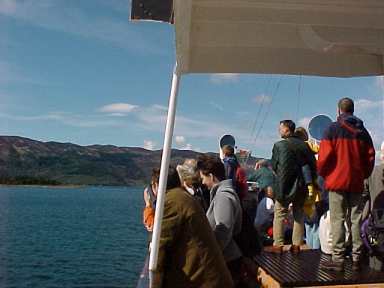 On to Helensburgh for its first 'steamer' excursion of the Millennium; another healthy crowd was embarked and the glorious sunshine encouraged us to stay on deck as we went over to Dunoon and down the Cowal shore to Rothesay, where a surprisingly large contingent was embarked for the first sail of the 21st Century into the far famed Kyles of Bute. Before leaving Rothesay, we noted that the Albert Pier at the east end of the harbour had recently been demolished. This pier had been used for decades (until the mid 1970s) by that very distinctive form of Clyde steamship known as the 'puffer' or more officially, the steam lighter. Scores of those sturdy little cargo ships, the early examples of which emitted regular puffs of white steam from their non-condensing engines (hence their colloquial name), had been a common sight on the West Coast of Scotland and further afield until the development of the articulated, juggernaut lorry and the RoRo vehicle ferry swept them into history. 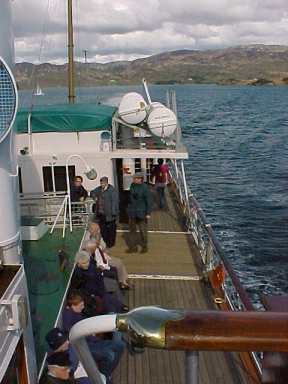 As Balmoral approached the 'Narrows' formed by the Burnt Islands at the confluence of the East and West Kyles and Loch Riddon, seasoned travellers gathered on deck to view this area of unparalleled natural beauty. Purser Jim MacFadzean has been known to profess that he could never tire of sailing through this magnificent area and few could disagree with that sentiment. On Easter Saturday 2000 the sunshine and air clarity showed it at its magnificent best. Also, Jim upheld another tradition by playing George Frederick Handel's overture 'The Arrival of the Queen of Sheeba' over the 'Tannoy'. This tradition stems from one of Jim's predecessor's, who started the practice in the early years of 'Waverley Steam' when the paddler often met the classic Denny turbine steamer Queen Mary at this place. It is unlikely that Handel ever saw the Kyles but, strangely, the music seems to compliment the scenery. 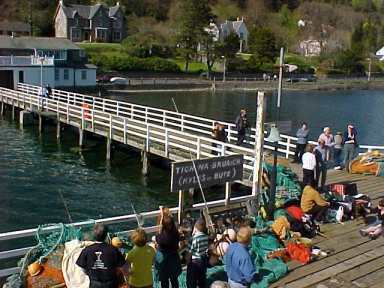 Although the tide was probably high enough to take the alternative route through 'the Dog leg' channel, we took the conventional main channel before swinging to port, into the West Kyle, for the short run down to Tighnabruaich, where we were all cheered to see the faithful volunteer pier 'crew' led by Sheila, a great friend and supporter of Waverley and Balmoral. Time for a run ashore and a quick visit to Suzy's Tearoom for a coffee or ice cream on the sun kissed terrace, or a visit to the Tighnabruaich Hotel, happily re-opened after a year of inactivity in 1999. 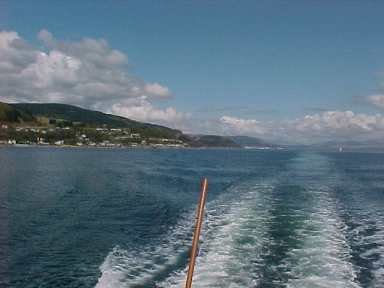 Tighnabruaich - now there's a name for you. It causes untold difficulty for foreign travellers from places like Detroit, Derby and Drumchapel. Many Clydesiders pronounce it 'Tinnabruich' but the true Gaelic speaker will pronounce it 'Tynabruach'. It is a Gaelic expression meaning the 'house on the hill'. On the pier there is an old, somewhat weathered, name board on which is printed the words 'Tigh - na - Bruaich (Kyles of Bute)'. A few years ago I was surprised to discover that some of the foreign visitors assume that Kyles of Bute is the English translation of Tighnabruaich, although the source of confusion seems obvious when your think about it. Well the board is part of the heritage now, so let's hope it survives in its old 'confusing' form.